A new British car show recreates a formula seen in the USA, but instead of customising old snotters, it restores neglected classics to their former glory and the delight of their owners. The show is called Car SOS, and is exclusive to National Geographic Channel. Presenter Tim Shaw, (familiar from Fifth Gear) teams up with mechanic/musician Fuzz Townshend, (The Wonder Stuff, The Beat and Pop Will Eat Itself). 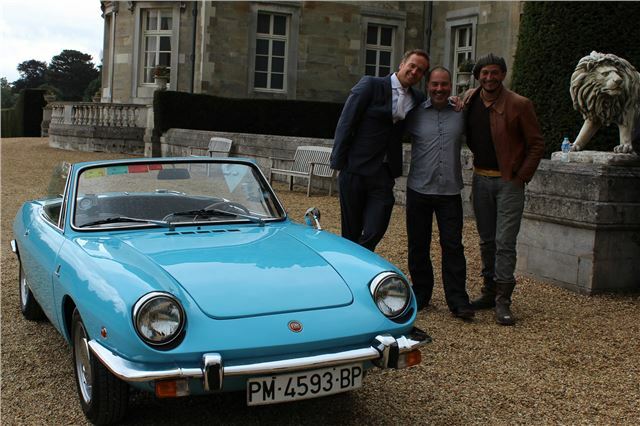 Together they retrieve, renovate and re-unite charismatic cars with their owners in an entertaining and emotional new TV show. The formula is to find a cherished car that has seen better days, add an owner in need a of a helping hand, then secretly whisk the wheels away to a well-equipped workshop, work on it for 3 weeks, then return to the surpsaise and delight of the unsuspecting owner. When his wife’s tragic death was followed by a near-fatal car accident, which broke his back, former mechanic Jeremy, from Dunstable, was left in great emotional and physical pain - and unable to restore his rare sky-blue FIAT 850 Spider. Nominated by his girlfriend Debs, Fuzz and Tim are called in to end Jeremy’s run of bad luck and give his pride and joy the makeover it deserves. It should be fairly straightforward but with the FIAT 850 Spider never having been sold in the UK, spares are rare and hard to find. Tim goes to hell and back (well, Italy) to find them, but is it worth it in the end? tears with a suspenseful and emotional outcome. This Southampton based VW Beetle, christened ‘Boris the Blade’ by its owner Nathan, may once have been a Love Bug but, having nearly bankrupted its owner, soon found itself gathering rust in the garage. Facing redundancy, financial issues forced Nathan to move back in with his mother and it looked like ‘Boris’ may never get back on to the road. After being nominated by Nathan’s fiance Carley, Tim and Fuzz strive to breathe new life into this fallen idol via a creative paint job and some innovative, and much needed repairs. And when it comes time to hand it back this Beetle turns out to have a sting in its tail. 30 years ago this was one of the most desirable cars on the road, but for brickie Darren Campbell from Oxfordshire; his classic 1986 Ford Cosworth RS only serves as a painful reminder of a family tragedy. On top of this heartache Darren was made redundant numerous times and went through a divorce. Wanting to bring some positivity into their Dads life, Darren’s 18 year old twin sons call in Fuzz and Tim who take on the tough job of resurrecting this faded 1980s king of the road. The Car SOS crew travel to deepest Bournemouth and discover a severe case of Anglia obsession. The Hutchings-Clarke family only have eyes for one car, each of them owning at least one Ford Anglia, all except poor James. James does have one but it having been stripped for spares and without an engine, Tim & Fuzz are implored to swoop in and rescue this sorry Anglia, but can they save it? The next 3 weeks are a blur of Anglia antics; high powered engines, lowered suspension, thumping hi-fi’s and supercool wheels. The finished car is Fuzz’s perfect Anglia and he’s fallen in love. It’s a painful parting for the master mechanic but will this supercool 60s ride get the welcome it deserves from its surprised new owner? Rover lover Steve’s terrible run of health problems meant his dream of renovating his 1972 P6 were never going to be realised. That was until, behind his back, wife Marie called in the Car SOS boys to resurrect this icon of upmarket British motoring. When Tim & Fuzz first see the old Rover they’re hopeful the work will be straightforward, that is until they start to take the old girl apart. Bit by complicated bit they realize they’ve unleashed a monster, gradually uncovering decades of shoddy botchery. Against the odds the lads nurse the Rover back to rude health and after 3 exhausting weeks the car is unveiled to Steve at the same East London bus garage where he first met his wife 2 decades before. But after this which day will be more fondly remembered by Steve? Answering a distressed wife’s SOS call, Tim & Fuzz head to Portsmouth on a mission to rescue an ex-navy diver’s Triumph Stag and hopefully put a smile back on his face. A hit-and-run incident 32 years ago led Morgan to gradually lose the use of his legs. No longer able to drive his beloved Stag it spent the last 18 years in his garage gradually being swallowed under a mountain of junk whilst he sank into the doldrums. Having spirited the Triumph away the boys switch out the transmission and install some customized pedals so the ex-serviceman can enjoy his much loved motor once again. Invited to the Bond exhibition at the National Motor museum in Beaulieu, unsuspecting Stag lover Morgan finds an exhibit with a licence to thrill.